14. The Fall, ‘Your Future, Our Clutter’. 23. Ariel Pink’s Haunted Graffiti, ‘Before Today’. 25. Avi Buffalo, ‘Avi Buffalo’. 26. Les Savy Fav, ‘Root For Ruin’. 27. Best Coast, ‘Crazy For You	‘. 29. No Age, ‘Everything In Between’. 32. Islet, ‘Wimmy’. 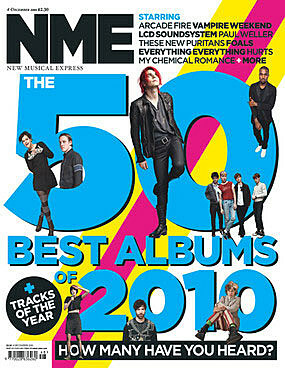 NME said: “Mind-bending. 33. Marina And The Diamonds, ‘The Family Jewels’. 34. Kanye West, ‘My Beautiful Dark Twisted Fantasy’. 38. Big Boi, ‘Sir Lucious Left Foot: The Son Of Chico Dusty’. 39. Magnetic Man, ‘Magnetic Man’. 41. Steve Mason, ‘Boys Outside’. 43. Everything Everything, ‘Man Alive’. 46. Paul Weller, ‘Wake Up The Nation’. 47. Pulled Apart By Horses, ‘Pulled Apart By Horses’. 48. My Chemical Romance, ‘Danger Days’. 55. Ikonika, ‘Contact, Love, Want, Have’. 56. Mount Kimbie, ‘Crooks & Lovers’. 57. Joanna Newsom, ‘Have One On Me’. 68. Edwyn Collins, ‘Losing Sleep’. 69. Happy Birthday, ‘Happy Birthday’. 70. Broken Social Scene, ‘Forgiveness Rock Record’. 71. Field Music, ‘Field Music (Measure)’. 74. Sufjan Stevens, ‘The Age Of Adz’. 75. The Eighties Matchbox B-Line Disaster, ‘Blood & Fire’.